"Suddenly we were talking about the possibility of the band re-forming, and in that moment it seemed that with the right intention it could actually be done and might even be great. "For four days it was a very real prospect...Morrissey and I continued our dialogue and planned to meet up again. I went to Mexico with the Cribs, and then suddenly there was radio silence. Our communication ended, and things went back to how they were and how I expect they always will be." Just imagine being at the pub witnessing Morrissey and Marr rekindling their friendship! Lucky for them, it was 2008 -- a time where smart phones were just getting introduced and camera phones took mostly worthless pictures -- so they were able to keep it on the down low. Had their pub meetup occurred a few years later, there would undoubtedly be photographic and video evidence. "...although I felt I’d created a moment of friendship, an air of disaffection and distrust remained between us. It was a shame." 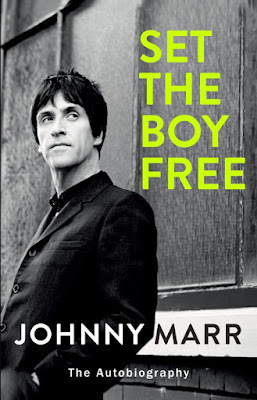 Read the full excerpt plus an in depth interview with Marr over at the Guardian . Set The Boy Free will be released in North America on November 15th (in the U.K. on November 3rd). Pre-order from Amazon.